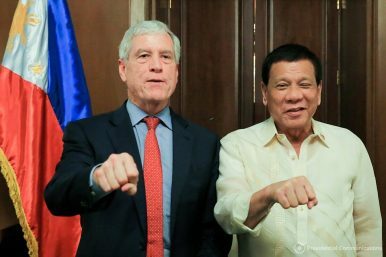 Australian Secret Intelligence Service (ASIS) Director General Nicolas Peter Warner joins Philippine President Rodrigo Duterte in flashing his signature fist bump in a move that sparked controversy. Warner had paid a courtesy call to Duterte at Malacañang Palace on August 22, 2017. On Monday, Australian Foreign Minister Julie Bishop made headlines when she revealed that she had offered additional military support to the Philippines during a meeting with President Rodrigo Duterte earlier this month. Though her comments about the offer were far from surprising considering the increasing cooperation already underway between both sides, they nonetheless sparked conversation because they would present both opportunities as well as challenges for both sides. Australia and the Philippines have long had a strong relationship that extends into the defense realm. Security ties include not just regular interactions like exchanges and exercises, but capacity-building in areas ranging from maritime security to counterterrorism as well as assistance with respect to the peace process in the southern Philippines. Defense ties had deepened even further during the years of former Philippine President Benigno Aquino III as part of the broader comprehensive partnership inked in November 2015. Among other things, the Philippines finally approved a visiting forces agreement (VFA) with Australia – making it just the second country to enjoy such a status other than the United States – and Canberra also became integrated into the U.S.-Philippine Balikatan exercises which have been gradually multilateralizing (See: “How Significant is the 2017 US-Philippines Balikatan Military Exercise?”). Though the emergence of President Rodrigo Duterte has no doubt complicated things, (as with the U.S.-Philippine alliance, as I’ve noted separately), day-to-day cooperation has largely continued and in some cases even accelerated in response to Manila’s dire needs as well as ongoing developments (See: “Battle for Marawi Exposes Philippines’ Military Intelligence Crisis”). The biggest example of this is the Marawi crisis, which has both exposed the well-known limitations of the Philippine military as well as heightened Australia’s fears of a deeper Islamic State presence in Southeast Asia with implications for regional as well as domestic security (See: “ASEAN’s Islamic State Conundrum”). It is therefore no surprise that Australia has been repeatedly discussing the ongoing situation with regional states including the Philippines and even offered various forms of support. The one that is discussed the most in public is Canberra’s provision of AP-3C Orion military planes to help with surveillance in Marawi, one of several offers that have come from a string of states including Singapore and the United States. But there are other lines of effort as well that Australian officials – including most recently Bishop herself as well as Australian Secret Intelligence Service Director General Nick Warner – have discussed with Philippine officials as well during their interactions. The public approval of an “advise and assist” Australian role in the Philippines would certainly more robust, since, if it is to be operationalized the way it has in Iraq, it would involve not just Australian equipment or expertise – be it in terms of intelligence, aircraft, or urban warfare training – but Australian personnel being directly embedded with Philippine counterparts on the ground. Though such a role is technically possible, The Diplomat understands that both sides would have to work out specific arrangements for this, since the VFA between them provides a general legal framework for personnel on both sides but does not include authorization for either party to deploy troops or conduct operations in the other’s territory. It would also be foolish to pretend that this is purely a strategic or technical issue. Advise and assist missions tend to arouse fierce public sentiment from certain groups on both sides – from fears of “creeping militarization” in the contributing country to suspicion of sovereignty violations in the host nation. The Australian mission in Iraq has not been immune from this sense of “creeping militarization,” despite repeated denials by officials. And Philippine defense officials so far have been keen to emphasize publicly, as Defense Secretary Delfin Lorenzana did following the announcement of the deployment of Australian AP-3C Orions, that such offers of assistance would not require Australian defense personnel being embedded on the ground. As I have noted before, the recent controversy over the U.S. role in drone operations in Marawi was an example of just how quickly and intensely the hype can build up in such instances (See: “What’s Behind the New US-Philippines Drone Hype Under Duterte”). Australia no doubt recognizes that it would also not be immune from other risks as well. As I have said elsewhere, given that we are living in the Duterte era, such a deeper and more explicit Australian military role in the Philippines also brings with it its share of risks, be it an outburst from the president or greater scrutiny on bilateral ties if Duterte’s poor record on rights continues, as Bishop’s and Warner’s recent trips have demonstrated. Australia-Philippines Military Ties in Focus With Patrol Vessels DealAustralia Warships Move to Philippines Amid Big Asia Military DeploymentWhat Will Australia’s New Military Terror Aid to the Philippines Look Like?What’s in the New Australia-Indonesia Military Pact?What’s Next for the New ASEAN-Australia Defense Meeting?